Have you ever made a trifle? I hadn't. Not before this deliciousness that I made the other day. I can't believe how easy a trifle is to make. All I had to do was pick out what flavor combination I wanted then just prepare the cake and fillings. The possibilities are endless. I can't wait to try my next one. Trifle is an elegant looking dessert that takes a minimum of effort with maximum flavor and can be served at any occasion. 1 - 8 or 16 oz. tub of Cool Whip, depending on how much you want to use. I used about 2/3 of the 16 oz. Bake the cake according to the package directions and let cool completely. Cut into 1-1/2 inch cubes. Prepare the pudding according to the package about 10 minutes before starting to layer the trifle. Place the raspberry jam into a microwave safe bowl and heat in 30 second increments until it is liquid. You will be making a total of three layers. In the bottom of a trifle bowl or a large glass bowl start your layering. One layer of chocolate cake cubes, and squish them in so the bottom is mostly covered. Next spoon on 1/3 of the jam. Next add 1/3 of the chocolate pudding then 1/3 of the Cool Whip. Chill for at least 3 hours before serving. Dish up and enjoy! Chocolate trifles is very common here so we make it quite often, but I've never made it with raspberry. 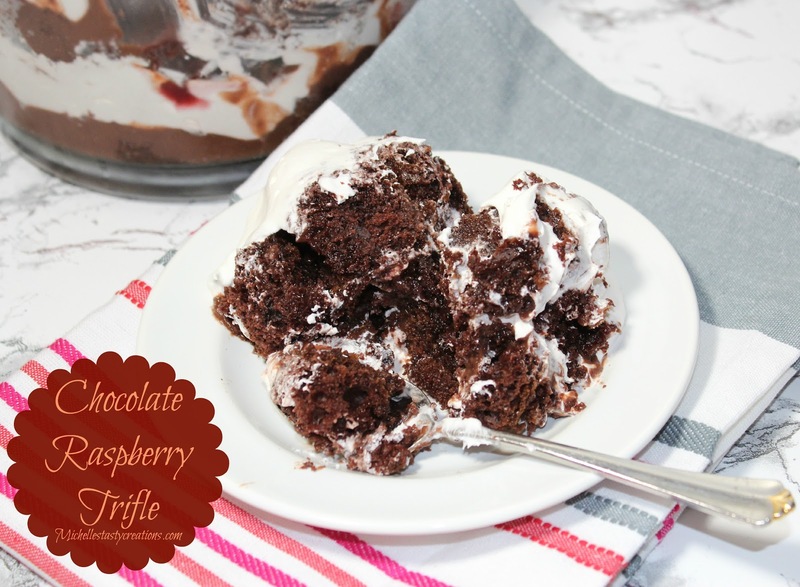 I've made trifle a few times - but I love the idea of raspberry and chocolate :) Pinned to try! I love trifles, and this looks very delicious. Lovely combination!